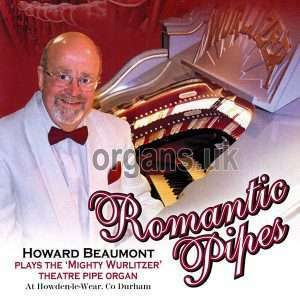 September 2017 release featuring popular romantic songs recorded at the Wurlitzer Theatre Organ in the New Victoria Centre, Howden-le-Wear, Durham (UK). I mentioned when reviewing John Mann’s June release, “Theatre Organ Magic,” that theatre organ CDs were a bit thin on the ground (I think I used the expression ‘Hens Teeth’). In fact, with only one passing my way in 2015 and another in 2016, this year already has two, so at least one chicken is now eating solids. 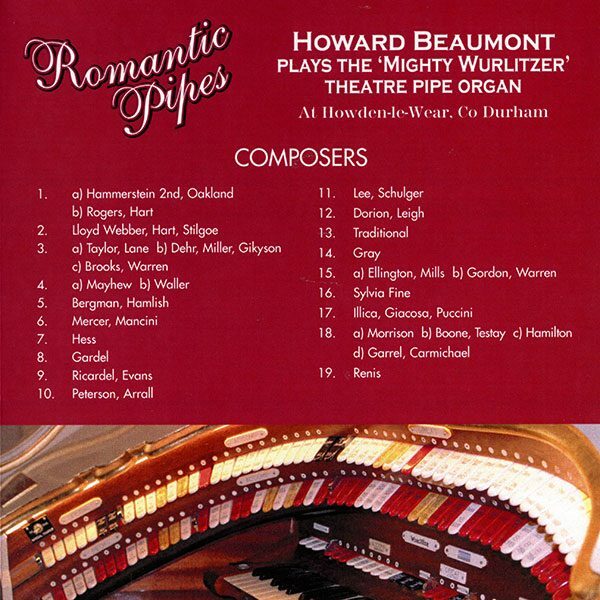 While Howard released an electronic organ CD in early 2016 called “Wonderful, Wonderful,” this is his first theatre organ one since “Tap Your Troubles Away” in 2013. That was recorded on the Saltaire Wurlitzer and now Howard has travelled eighty miles north for this new recording and to the Wurlitzer in the New Victoria Centre, Howden-le-Wear. 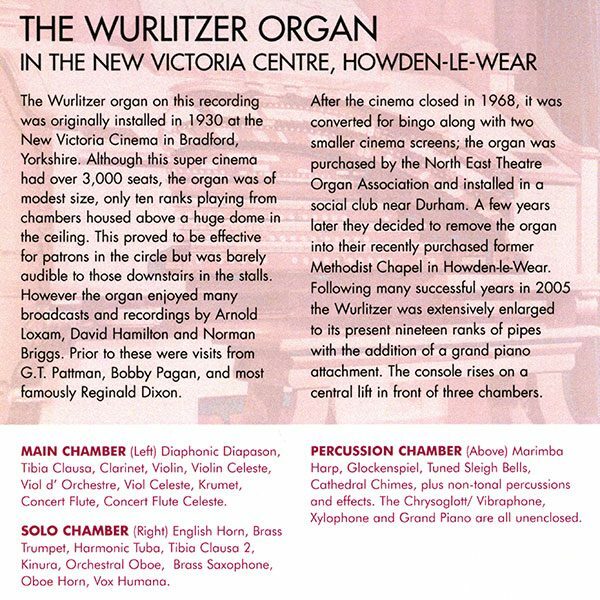 The three manual Wurlitzer on this CD was originally installed in the New Victoria Theatre, Bradford in 1930 and if you are interested in the details, it’s a Style ‘220 Special’ (Opus No.2116). The cinema closed in 1968 (another case of Bingo-itus) and the organ was bought by the N.E.T.O.A. 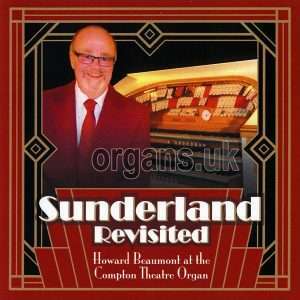 (The North East Theatre Organ Association). It was moved to a social club near Durham for a couple of years before they’d saved up enough money to buy a Methodist Chapel to put it in, this was in Howden-le-Wear, County Durham where it was finally installed in the early 1970s. In 2005 it was extended to nineteen ranks and a grand piano attachment added. We’ve stocked a few CDs that have been recorded there over the years; a couple from Dr. Arnold Loxam and one each from Nigel Ogden, Joe Marsh, William Davies and Con Doherty. Sadly, we only have a few copies of one of them now, the “Dr. 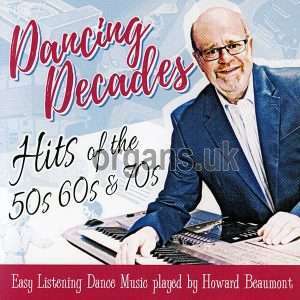 Arnold Loxam Celebrates” CD (which we have available for £4.95). 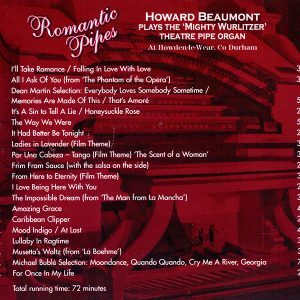 Now onto the CD and as the title suggests the album features a selection of romantic tunes (and a lovely bunch they are too). The sound is beautiful with a rich warm tone and a lovely variety of tones and styles. I only noticed when reading the sleeve that they are all taken from movies, which I hadn’t spotted. I think some of the songs were featured on stage musicals first, or were already known songs before being added to the films. Most of the titles seem to sit around the golden era of popular song of the 1930s and 1940s, with some exceptions. 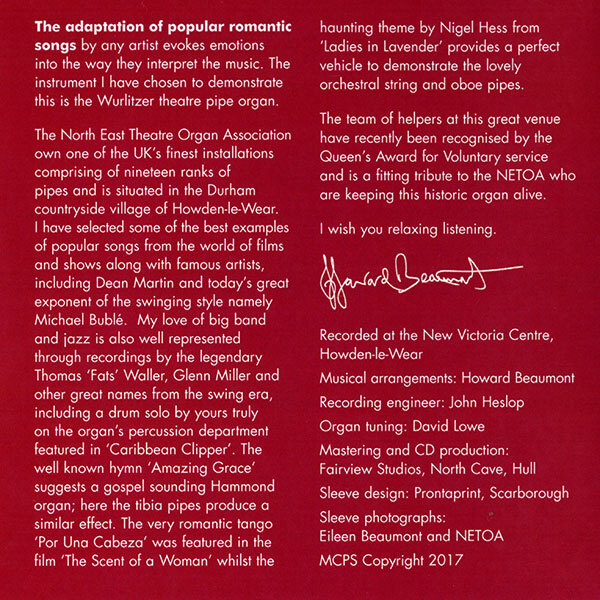 I think the latest is Nigel Hess’ “Ladies in Lavender” from 2004, then “All I Ask of You” from “The Phantom of the Opera” from the mid-1980s and a couple from the 1970s. I was going to mention the lovely fresh swinging arrangement of Van Morrison’s “Moondance” as one of the ‘modern’ tunes until I noticed that it was recorded in 1970, so that song is pushing fifty! 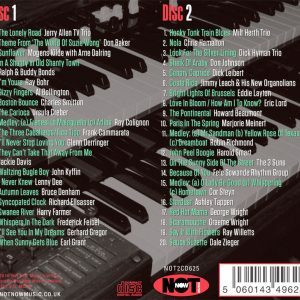 There are a couple of unique medleys for organ CDs on this release with Dean Martin and Michael Bublé both having their own selection, which should cater for the lovers of the old and new ‘crooners’ amongst you. Some of the songs in the medleys may be favourites, but it’s the first time I have seen them ‘blended’ together in this way. 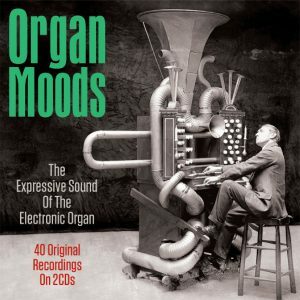 Talking of unique items, there are a few tunes here that I don’t think have seen the light of day on organ CDs. 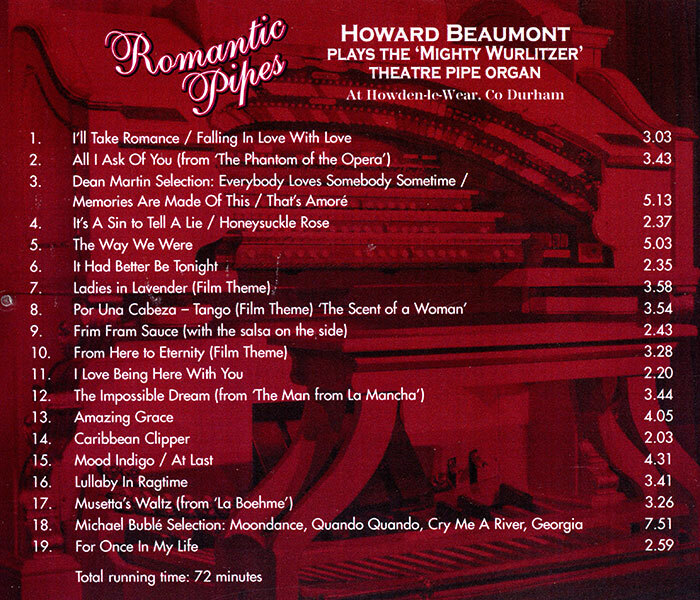 We have the aforementioned theme from “Ladies in Lavender,” “Lullaby in Ragtime” and “I Love Being Here With You.” The Glenn Miller Big Band tune, “Caribbean Clipper” could have been included in the list too, but I notice that Howard recorded it on the Blackpool Tower Wurlitzer on the “25 Years of the Organist Entertains” CD way back in 1994. This version has a nice drum solo which shows off the percussion department of the organ (and Howard’s keyboard-drumming talents too, of course). Highlights of the CD include the opening mix of “I’ll Take Romance” and ”Falling In Love With Love,” a dreamy version of “The Way We Were” and a gospel version of “Amazing Grace with some nice improvisation fills.” There is a sweet medley of “Mood Indigo” and “At Last” and the CD closes with a slow ballad version of “For Once In My Life,” pre-Stevie Wonder’s upbeat version. 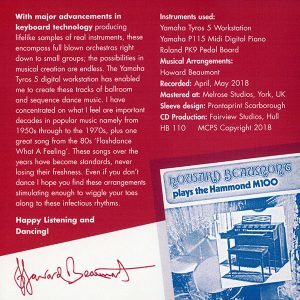 This is another fantastic CD from Howard, who seems to like mixing his output a little, with Electronic Organ, Piano/Keyboard, Hammond Jazz, Sequence and Theatre organ CDs released over the past ten years or so. A bit like a box of chocolates, you never know what you’re gonna get next, which is always nice (unless you get a toffee! ).